Despite having over 4,000 subscribers to my YouTube channel (who are these people?) I’m very much a writer rather than a videographer, and I don’t taking my video editing especially seriously. You could call me a proponent of the 1980s Blue Peter school of video editing. Give me an old washing-up liquid bottle, a pair of scissors and some sticky-back plastic, and I will knock together a video for you, but I’m not going to enter it for any awards. It’s taken me a year to get around to editing this footage, but here it is for those of you who like listening to background noise set to breathtaking scenery. 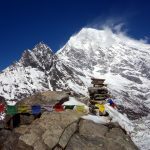 Some of my favourite trips have been those to climb trekking peaks in Nepal, where the ascent of a relatively straightforward 6,000m mountain has been accompanied by three weeks of fantastic trekking among forest valleys and high passes. 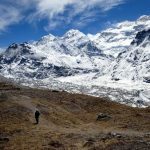 We knew the Kangchenjunga base camps trek in the far east of Nepal would provide fantastic trekking, but we were less sure of which peak to climb. The only officially designated trekking peak, Bokta, was known to be a serious proposition with dangerous avalanche risk – not our type of peak at all. But other suitable mountains in the region were either bigger or more remote. This meant that either we would need more time, or the focus of our trip would become the mountain rather than the trek. We wanted both, which meant finding an easier peak which would only take a day or two to climb. 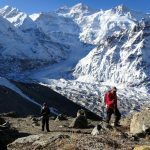 After rejecting a longer climb up Tengkoma Peak, we were intrigued by a peak that Jamie McGuinness suggested to us, which he said was a short hike above the teahouse at Pangpema, beneath the north face of Kangchenjunga. He said that it was really just a bump on the shoulder of Drohmo, a much larger and more serious mountain nearly 7,000m high, but it felt like a distinct peak, and he believed that it was just over 6,000m high. It was an easy walk up, and we may not even need crampons if there wasn’t much snow. We wouldn’t be disappointed by the view, he told us. It sounded like we wouldn’t have any problem climbing the peak; we were going to have more difficulty finding it. It turned out that our guide, Gombu, hadn’t been briefed about our plans. Although we had hired him as our climbing guide for the peak, he hadn’t brought a rope or crampons. This was going to limit our options if there was a lot of snow. 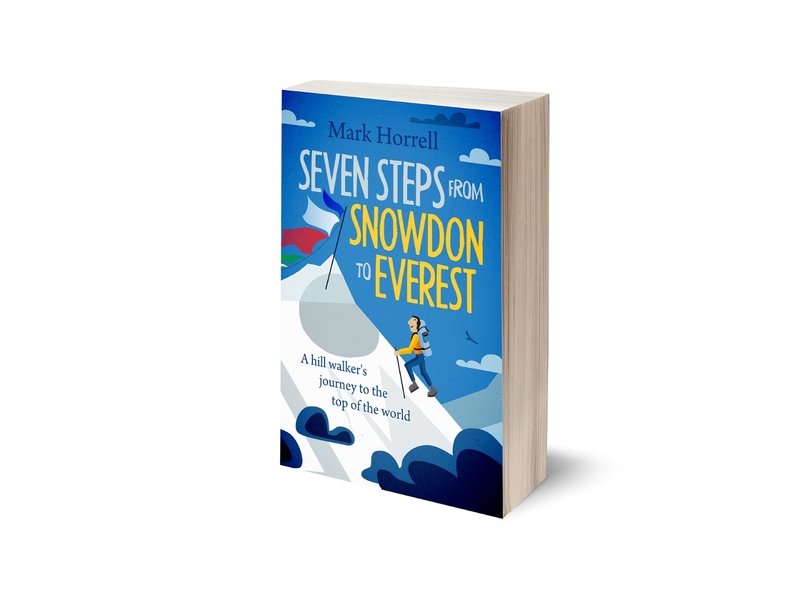 He had once tried to climb the north face of Kangchenjunga as part of a Korean expedition, but he hadn’t climbed our peak, and had no idea of its location. All we had to go on was a few notes Jamie had sent me in an email, including a screen grab from Google Earth with the peak’s rough location marked on. Jamie and I exchanged this Google Earth image trying to identify his peak. I drew on the likely location of his bump. He put a dotted line on indicating the actual location. We ended up climbing neither. As we walked up to the single teahouse at Pangpema, the location of the Kangchenjunga’s north side base camp, we surveyed the north side of the valley trying to identify our peak. Meanwhile on the south side of the valley we looked up at Kangchenjunga itself. 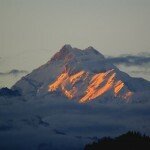 Most people climb Kangchenjunga from its south side, and its north side has seen only a handful of ascents. The reason is clear. The north face is a sheer wall of hanging glaciers, ready to collapse at any moment. This wall is topped by both Kangchenjunga’s main summit (8,598m) and its west summit, also known as Yalung Kang (8,505m). The mountain was first climbed from this side in May 1979 by Pete Boardman, Joe Tasker and Doug Scott. They skirted beneath the terrifying north face to a col, the north col, which gave access to a ridge descending from the main summit. 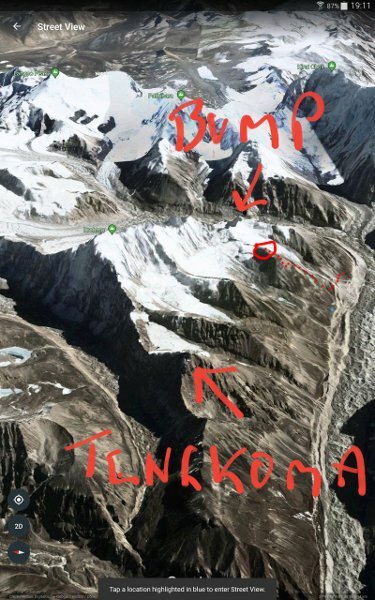 Their route skirted beneath the main summit to the col between the main summit and Yalung Kang. From here they were able to join the route from the south side which Joe Brown and George Band had taken on the first ascent in 1955. I tried to identify these features as we approached Pangpema. We decided that Jamie’s peak must be the one directly above the teahouse. We called it Drohmo Ri. According to our map it was around 5,900m. In fact, Jamie had been referring to a different peak, but it didn’t matter. As we climbed above Pangpema, Kangchenjunga’s north face was revealed in all its glory. The peak hadn’t looked very high from Pangpema, but as we ascended it went on and on, up easy grassy slopes to begin with and then over boulders. Would it turn out to be 6,000m after all? 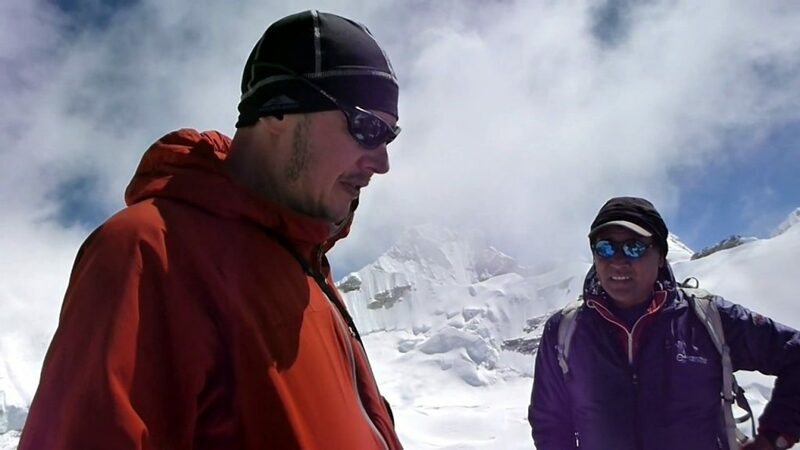 There was an amusing moment on the summit as Gombu and I discussed how Kangchenjunga got its name. I had always understood that the name meant Peak of the Five Great Treasures of the Snow, but I wasn’t quite sure why. I dimly remembered reading somewhere that its name should be more properly written Kangchendzonga. A dzong is a fort, a kang is a peak, and nga is the number five in the Sherpa language. But how to put these together to get the peak of the five treasures of the snow? Gombu didn’t agree, and as he is a Sherpa who speaks the language, who was I to argue? But unfortunately I had difficulty understanding him. Our discussion petered out. ← Swearing in travel writing: when is it acceptable? Neat that you got a nice trip and climb even without being quite sure which mountain you were aiming for. It sounds like Nepal is spoiled for choice! I’ll bet the scenery is even more impressive in person.